In the first and second part of the series we explained how the concept of PPP model for Ejipura EWS quarters evolved and the reasons for the delay in implementation. This part will explore the nitty-gritty of project plan sanction. Why did the BBMP give plan sanction only for half segment of the project but has refused to approve other half of the project that comprises commercial establishment to be shared between the City Corporation and Maverick Holdings? When on May 31st, 2017, the High Court passed an order directing Maverick Holdings – the project proponent of Ejipura EWS quarters – to cough up half of the plan sanction fee to the BBMP, to get the plan sanctioned and begin the work without further delay, Uday B Garudachar may have heaved a sigh of relief. For Garudachar, the Managing Director of Garuda Group which owns Maverick Holdings, this mega housing and commercial project in a prime area spread over 15.6 acres is quite an ambitious project. But the project is not a smooth sail yet. In order to comply with the recent High Court order, the BBMP has approved just one part of the project plan, denying approval to the entire project until certain issues are resolved. In the first part of the series, we had reported of Garudachar criticising the City Corporation for delaying the plan sanction. “The City Corporation unnecessarily postponed the process of plan sanction. The government shouldn’t have taken up PPP project if they cannot felicitate its smooth functioning,” he had said. And when I spoke for the second time to Uday Garudachar asking about the project plan sanction he said that he has got the plan sanction for the entire project. But the facts indicate otherwise. There are enough reasons for the BBMP to delay the plan sanction, and it is not as simple as it was portrayed by the developer. Contrary to the claims made by Garudachar, the BBMP has not yet sanctioned the plan for the entire project. Speaking to Citizen Matters, a BBMP Town Planning official on condition of anonymity said that his office has not issued plan sanction for commercial part of the project for two reasons. “A stormwater drain flows close to the project area. Earlier, the government had passed an order directing to maintain 41 metres buffer zone around the SWD in the project site. 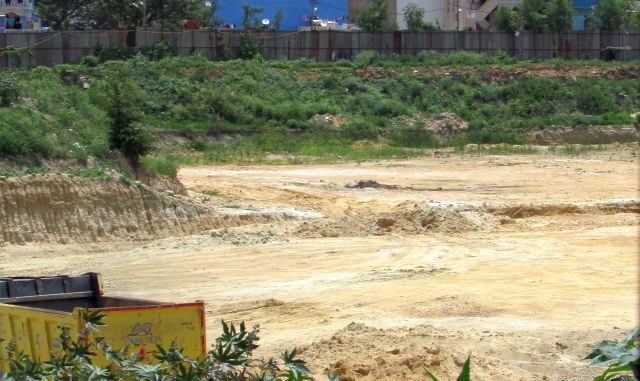 The government had okayed the developer’s initial plan with 41 metres buffer zone and the Bangalore Development Authority (BDA) too had granted the development plan approval,” he said. But the National Green Tribunal’s order making it mandatory to maintain a buffer zone of 50 metres around primary SWD has come as a hurdle to Maverick’s project. “Soon after the NGT order was passed, the State government withdrew its permission order for the project. The developer will get project plan sanction from the City Corporation only after obtaining fresh development plan from the BDA by adhering to the NGT norms,” he said. He also clarified that since the land belongs to the BBMP, the civic body wouldn’t let the developer build the project violating the rules. “It is a public property. People are going to live there. BBMP will be responsible for any of the mishap or difficulties that people living in the project site in future,” the officer stated. When Citizen Matters spoke to BDA Town Planning Director Tippe Swamy, he confirmed the proponents of any development project on an area exceeding five acres, who have received development plan prior to the NGT order should now apply for fresh plan sanction. “The NGT order on buffer zone is applicable to all those projects to which development plans were sanctioned earlier but are yet to receive plan sanction from the City Corporation. They have to comply with 50 metres of buffer zone in case of primary SWD,” he said. Uday Garudachar on his part has stated that he would not follow the new buffer zone rule. He has decided to approach the Supreme Court challenging the NGT order on its retrospective effect. Another issue the developer has to sort out before commencing the entire project work is shifting of a small SWD (pillugaluve) from the project area. This small SWD which Garudachar calls as “fictitious” and says doesn’t exist, exists according to the 110-year-old village map based on which BBMP’s SWD clearance drive was done last year. The Town Planning officer from the BBMP said they came to know about the presence of SWD in the project area recently when they checked the village map for plan sanction. “This can be shifted with the permission from the office of the Assistant Director of Land Records (ADLR),” he said. When I enquired at the office of the deputy commissioner about the possibilities of shifting SWD to pave the way for development projects, a staff at the DC’s office said, the DC office forwards such requests to the State government and it is left to the discretion of the government to decide if the SWD could be shifted or not. In a nutshell, the permission to divert SWD is given for selected few projects. Uday Garudachar had told me that he would contest this issue of small SWD in the court. “I have leveled the land in the project location and did not find any trace of SWD. It was diverted or closed long back. Why raise the issue now? We are going to contest this in the court,” he had said. It could be recalled that the same 110-year-old village maps formed the basis for the State government to clear the storm water drain encroachments in the city. Following the encroachment clearance drive, Citizen Matters in a series of stories had explained how the BBMP had let the encroachments happen by not verifying the village map while sanctioning the house/project plans. The third issue is of the hi-tension wire that passes through the project area. In 2014, the BDA issued the development plan for Maverick’s EWS project with a condition. The developer was told to get the project plan sanction from the City Corporation only after shifting the HT line. But even after three years of obtaining the development plan, no efforts were made from the developer to shift the HT line. The BBMP Town Planning officer said since the High Court has directed the City Corporation to issue plan sanction without delay, they issued plan sanction to half of the project (EWS portion) but with a condition that the work should commence only after shifting the HT line. 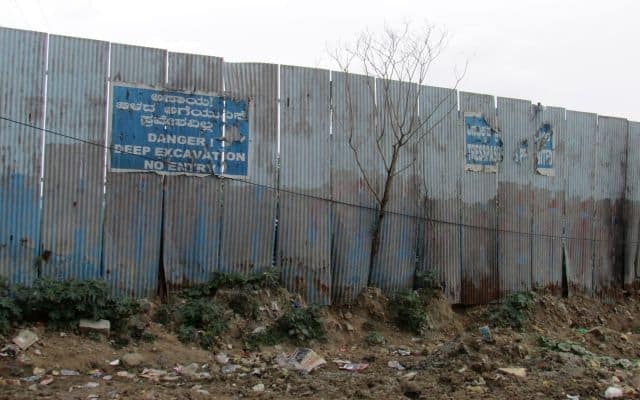 Also, the developer should get permission from the Karnataka Power Transmission Corporation Limited (KPTCL) and maintain buffer zone if they are pushing the HT wire underground. “Therefore, the plan approval that we have given for half of the project now, too is not final. It’s a temporary approval, just to commence the work,” the Town Planning officer said. However, for most of the issues raised above, the developer shrugs off saying they are “trivial” and will be sorted out eventually. While it is not yet clear how the BBMP and Maverick are going to ensure that all the stumbling blocks are cleared for the project without scope for violations, the grey areas in the concession agreement signed between two parties only adds to the concern. With both the parties interpreting the agreement differently, will it lead to yet another conflict and litigation between the BBMP and Maverick Holdings? Let us know more about it in the next article of the series. IAC is demanding for Police Complaints Authority to be set up at both district and state levels. Though this is based on a Supreme Court order, will the state government act?